Provenance Restaurant + Bar (on the Collingwood-not-Fitzroy side of Smith Street, and not to be confused with the more formal restaurant of the same name in Beechworth) was the venue of choice for a recent impromptu brunch with three of my very favourite people in the world: best-friend-K, Schatzi and housemate DJ. Schatzi's partner M and their beautiful baby boy were also in attendance. 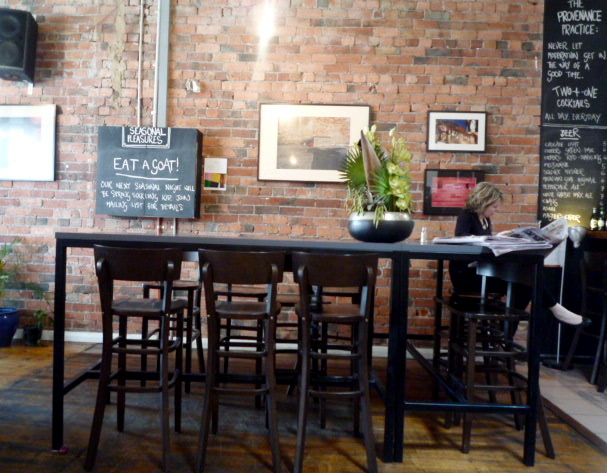 I'd never been to Provenance before, but heartily approved of their tempting brunch menu and pressed metal ceilings. Oh, DJ. Despite a massive night and very little sleep (and with a blood alcohol level that could still be accurately described as "festive"), he was still bouncing around making witty conversation, wearing my (womens) sunglasses and hiding behind pot plants. Play 'Spot the Housemate'! 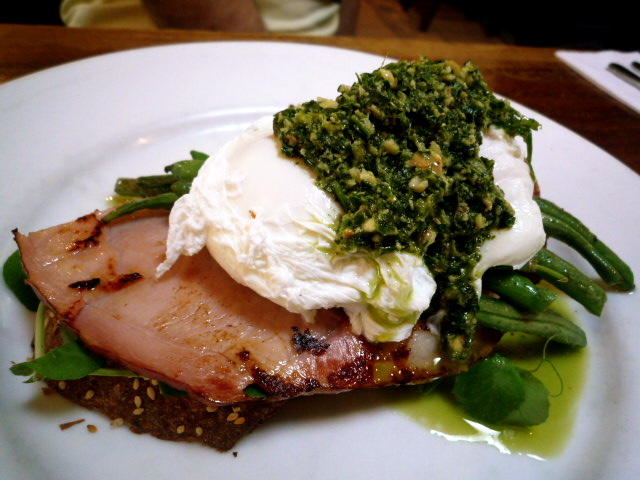 DJ ordered the breakfast special, the Green Eggs and Ham ($14). They'd run out of the advertised asparagus, so substituted beans. Nice big dollop of pesto. 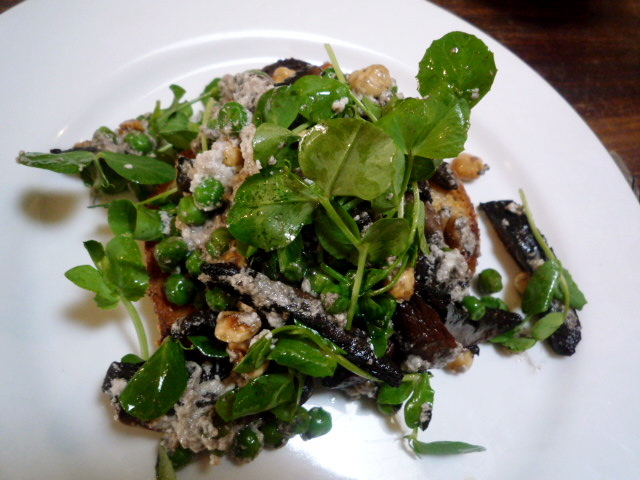 I ordered the mushrooms and peas with hazelnut, ricotta and thyme salad ($13). I'm not normally a big fan of peas, but I'd remembered someone writing positive things about this dish on Twitter so I ordered it. Glad I did. The ricotta and mushrooms blended nicely, and the hazelnuts were a lovely subtle touch. 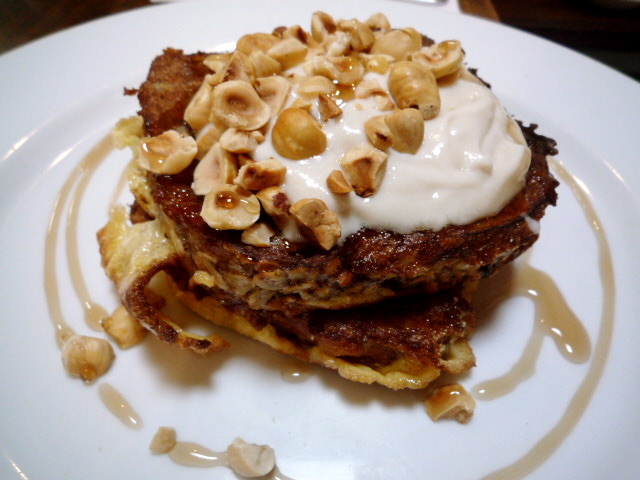 B-f-K wanted something sweet, so chose the French toast with apricot, fig, maple yoghurt and hazelnuts (also $13). They like their hazelnuts at Provenance! As well as being a reliable source for decent coffee and brunches on Smith Street, Provenance hosts a series of interesting-sounding degustation dinners based around key ingredients, eg "Get Fig'ed", "Quince This, Quail That" and "How Mushroom is Too Mushroom" (the last one was recently reviewed by Fitzroyalty). I'm keen to head down to one of these dinners soon. The next event is a goat degustation this weekend (see site for details) called "Something to Goat About". It's being advertised using a photo of the most adorable soft-eared kid you've ever seen - awwwwww! Just made my booking for this Saturday. Can't wait!! Thanks for the heads up Claire. Mmm looks good. But I think it would kill me to go to a lesser provenance. We finally made it to Beechworth last week. The vegetarian degustation was possibly the best meal I've ever had. Certainly in recent memory. All I can say to every fooodie I meet is "go. splurge!" Oh, and the matching wines weren't half bad either. I'm just so glad they do seasonal menus.. so I can go back! I'll be goating on Sunday night - come and join us! Your brunch experience sounded bunch better than mine - I gave them a NOT as the only food item our table of 6 enjoyed was the bread. Maybe they've found a new chef now and are back on form. i LOVE this place and go there regularly. Yet to be disappointed! Yeah, you may be right. I've been twice about a year ago and haven't been enticed back since (I live closer to Brunswick St than Smith St). Went for breakfast both times, and while it was ok, it wasn't much better than the standard fare you can get elsewhere. 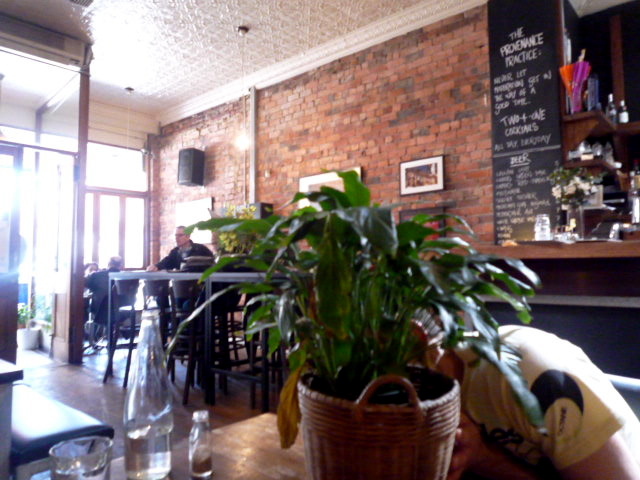 My favourite breakfast spot at the moment is Birdman Eating in Gertrude St - that is worth the trip. I was really disappointed after reading your fantastic review. The service was average, some of the food was cold and to be honest some of the serving portions were a bit on the small side.